I am pleased to take part in the Blood Brother book tour today; the book hits shelves tomorrow! 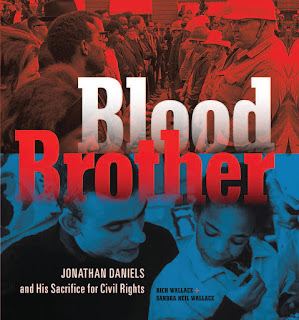 Blood Brother is the important and little-known story of civil rights activist, Jonathan Daniels. The Wallaces learned about Daniels when they moved to his hometown of Keene, NH. The authors spent a great deal of time researching and "sleuthing" to piece together the details of Daniels' life. They conducted interviews, read personal letters, located photographs taken by Daniels, and studied material from the Jonathan Daniels Collection at Keene State College. 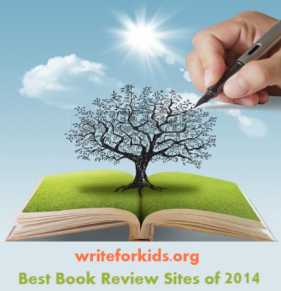 The result is a highly engaging and informative nonfiction narrative for teens. Daniels was a seminary student in New England in 1965. Inspired by the work and words of Dr. Martin Luther King, Jr., Daniels traveled to Alabama to join the fight for civil rights. Daniels was white and from the north, which made him a target for harassment by police and locals. The authors show Daniels as a compassionate and brave individual who looked for the most effective ways he could make an impact in ending segregation. Daniels volunteered on voter registration drives, fought to integrate churches, and participated in the historic march from Selma to Montgomery. One of the most impactful things Daniels did was to purchase a camera and photograph the violence he witnessed. He also took photos of contaminated water supplies and poor living conditions in some African American communities. Young adult readers will be saddened to learn of Daniels' violent, shooting death upon being released from jail in Hayneville, Alabama. Despite eyewitness accounts of the shooting, the murderer was found not guilty by an all-white jury. A civil lawsuit following the trial later brought changes to the judicial system in Alabama. The Wallaces weave together quotes, descriptions of events, powerful photographs and primary documents to paint a vivid picture of the people behind the civil rights movement. Be sure to read the back matter including the timeline, bibliography and authors' note. Pair Blood Brother with March: Book One, Turning Fifteen on the Road to Freedom, or Freedom Summer. Don't miss the Blood Brother book trailer. I'm really looking forward to reading this!! He sounds like an amazing man! Three years in the making and filled with ground-breaking research, I hope you'll find Jonathan's story both compelling and also inspiring. I tried to share this with my Facebook readers, but it was blocked as "offensive" and "a security issue." 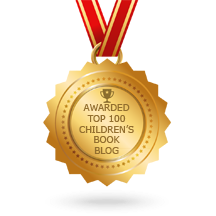 WTH Congratulations on a great book! Hmmm . . . Facebook is weird. Thanks for trying Larry! I'll try to share it, and if it works you can share my share!